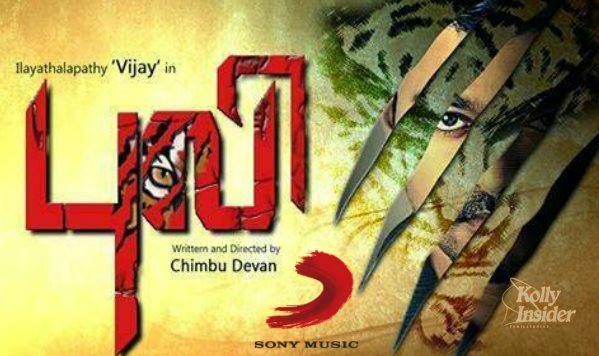 After bagging Thalaivaa audio rights, Sony music has bagged the audio rights of Vijay’s upcoming movie Puli directed by Chimbudevan for a whopping undisclosed price. The news has been confirmed on the official Twitter handle of Sony Music South (@SonyMusicSouth). This is the second time that Sony music has bagged the audio rights of a Vijay movie, previously acquires Thalaivaa rights. "After the success of Thalaivaa, We're proud to have #Ilayathalapathy with us one more time! " tweet by Sony Music South. Currently, the film is being shot in Kerala at a museum. “Vijay is now all set to shoot for a present-day sequence inside a museum in Kerala,” the source added. “Puli” is a fantasy adventure movie, which is directed by Chimbu Devan. The Tamil movie features Kannada superstar Sudeep as an antagonist. He will be playing the role of a Commander of Sridevi’s kingdom in the Tamil film. In terms of budget, it is the most-expensive project of Vijay’s career. The film is bankrolled by S Thameens and Vijay's press relations officer Selvakumar, who have been handpicked by Vijay himself. Apart from Vijay and Sudeep, Shruti Haasan and Hansika Motwani are acting in the female lead roles in “Puli“. Prabhu, Nandita, Vijayakumar, Thambi Ramaiah, Naren, Soori, Joe Malloori, Ajay Rathnam, Ali, Srinivasan, Vidyullekha Raman and others are in the cast along with Devi Sree Prasad doing the music. Expectations are sky high for "Puli" album as Devi Sri Prasad is joining hands with Vijay again after Villu (2009). The composer had earlier stated that there will be a lot of surprises in "Puli" album. This has kindled the curiosity of the fans and they are eagerly waiting to listen to the songs. "Puli" shooting, which commenced in December 2014, is on the verge of completion. The film's first half is completed, while the second half is set to get wrapped soon.